If you are looking for a unique dining experience, follow the sign into the restaurant at the Hotel de la Marine at the Fortress of Louisbourg in Cape Breton, Nova Scotia. You will be served by waiters dressed in authentic period costumes and all the utensils and surrounding decor make you believe that you are living in the 1700's. Sign outside the Hotel de la Marine Restaurant at the Fortress of Louisbourg, Louisbourg National Historic Site, Highway 22, Fleur de lis Trail, Marconi Trail, Cape Breton, Nova Scotia, Canada. 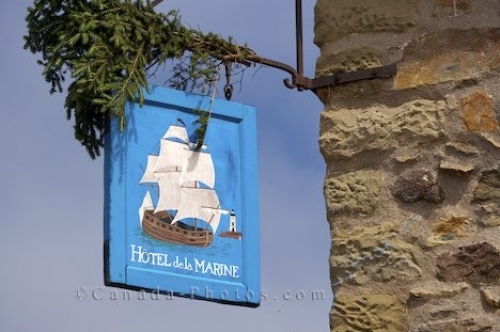 Picture of the sign outside the Hotel de la Marine Restaurant at the Fortress of Louisbourg in Nova Scotia, Canada.